AV nicking which is also known as arteriovenous nicking is a condition or phenomenon in which a small artery crosses small vein causing vein compression in eye. It is a microscopic phenomenon which can be seen with a microscope only. When artery compresses vein, it results in vein compression and blood pressure increases on either side of vein. This increase in blood pressure leads to bulging of vein which appears prominently in microscopic examination of eye. AV nicking commonly occurs in an eye disease caused by high blood pressure named hypertensive retinopathy. It occurs because both arteriole and venule share a common sheath. When arteriole crosses venule with its thicker walls it leads towards compression of venule and as a result blood pressure rises on either side of venule. This causes hypertension in eye. The vein bulge out due to hindrance in blood flow and causes hypertension. This hypertension can cause damage to arterioles present in other organs of body like heart, kidney and brain. The phenomenon of AV nicking causes hypertension and on other hand chronic hypertension is the commonest cause of AV nicking. So, AV nicking is closely related to hypertension related diseases. As AV nicking causes high blood pressure (hypertension). This high blood pressure remains sustain until the problem is solved. So the symptoms of AV nicking resemble symptoms of high blood pressure (if any). Symptoms of AV nicking may involve severe headache, pain in eye, pain in vital organs where hypertension may spread, problem in vision, blurry vision, confusion, vertigo, fatigue, dizziness, difficulty in breathing, irregular heart beat normally tachycardia. There may be blood in urine, pounding at the site, neck, chest and ears. Only few of the above mentioned symptoms occur in case of AV nicking in eye. Hypertensive retinopathy is considered the commonest cause behind AV nicking. Research states that venules and arterioles share a common sheath. 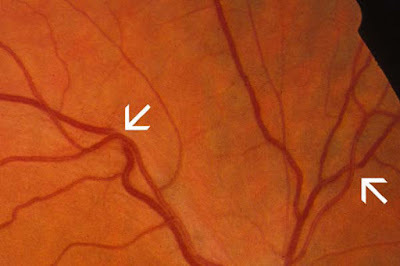 Arterioles have thicker outer walls as compare to venules. These thicker boundaries compress venule upon crossing. Compression of venule makes it appear in the shape of an hourglass around the arteriole. Some scientists believe that AV nicking does not occur as a result of venule compression but occurs due to sclerotic thickening of venule or due to glial cell proliferation at the site (site at which arteriole crosses venule in eye). These above mentioned phenomenon are the only causes reported till now. AV nicking is related to hypertension so its treatment requires life style modifications to manage hypertension. Along with life style modification, dietary modification is also required to manage high blood pressure problem naturally. If patient do not respond to these natural ways of managing blood pressure then medications are recommended. These medications involve all medicines which are used to control and manage high blood pressure. If it is left untreated, then it can cause further problems in eye like retinopathy, glaucoma and sometimes cause damage to optic nerve leading to vision problems.